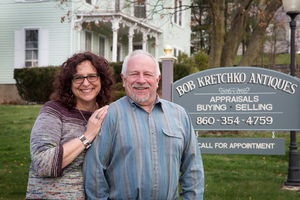 The third time is a charm, a vintage one, for Bob and Loretta Kretchko who will be returning for the third time to the Treasure Trunk at Litchfield Crossings on September 15th from 10pm to 3pm. The couple has been buying and selling antiques for three decades, half of those in New Milford, where Loretta grew up. Active community volunteers, the couple spent countless hours raising funds and supporting the preservation projects of the New Milford Historical Society and Museum, which is the beneficiary of the Treasure Trunk. “Our goal is to stimulate interest in New Milford’s culture and history, our passion is to help preserve the beautiful town we call home,” says Loretta. “We welcome Loretta and Bob for the third year,” says Kristen Gizzi, Executive Director of Litchfield Crossings, “We are appreciative of their continued support,” she adds. All proceeds will benefit The New Milford Historical Society and Museum. Stop by the Treasure Trunk at Litchfield Crossings, 169 Danbury Road, New Milford, Ct from 10:00pm to 3:00pm. Free parking and admission. Space still available for antique and vintage vendors as well as artists and craftsman and local produce growers.